An army brat born in England, Ann lived all over the UK in her youth. She grew up loving history, and her favorite part of any holiday is to visit an English country house, a castle or a museum. Now living in Canada with her husband and two lovely daughters, she has acquired a Maltese terrier called Teaser, who likes to sit on a chair beside the computer while she creates her award-winning romances. After Ann’s first book was published in 2006, she began to write full-time and hasn’t looked back, with more than 30 titles published around the world. Ann loves reading and writing about the Georgian era, and within that the period known as the long Regency. She also adores happy endings. People often ask where she gets her ideas. Well—it’s magic. She sprinkles fairy dust over her computer every morning. If only that were true! Most of her ideas come from daydreams about things going on in the world and from her research into the era. From there, the what-ifs follow in quick succession and the idea for a story takes shape. After the dust settles, the ideas are wrestled into the shape of a novel about characters she hopes her readers will fall in love with. 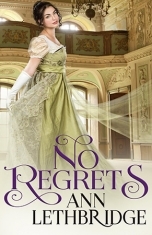 Over the years, several of Ann’s books have won awards, including an honorable mention by Foreword magazine for No Regrets. Several of her books have been awarded the Romantic Times KISS (Knight in Shining Silver) designation. She is particularly proud of her 2009 win of the Daphne du Maurier Award for Excellence in Mystery/Suspense. Who doesn’t love a bit of mystery and suspense mixed in with their romance? 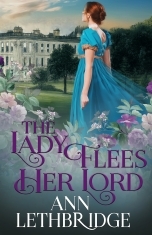 Ann gives talks on the various aspects of publishing as well as workshops on the craft of writing, and blogs regularly about her research on her Regency Ramble Blog. If you would like to contact Ann, you can reach her at annlethbridge.com.